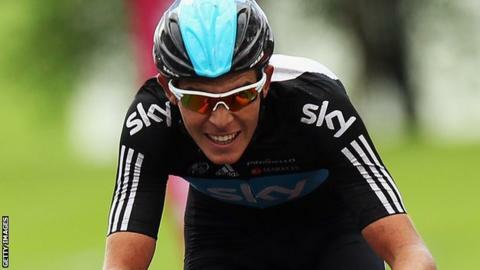 Luke Rowe believes his recent form will stand him in good stead at the Road World Championships in the Netherlands. Team Sky's Rowe recently won the first stage of Tour of Britain, his first professional victory. The 22-year-old will be part of the nine-strong Great Britain team which will compete in the road race in Maastricht on Sunday. "It's been a successful month and I just want to keep that ball rolling until the end of the season," he said. "The last month I've really started to find my feet at the top level at pro level. I struggled towards the start of the year but starting to establish myself now." Rowe finished 18th overall in the Tour of Britain and was placed 14th overall in the Post Danmark Rundt in August. The Welshman expects to play a supporting role in the 267km race, which was won by Great Britain and Team Sky team-mate Mark Cavendish in Denmark last year. "I'm going there purely as a supportive rider," Rowe said. "Cycling's such a team sport and them guys possibly won't be there at the end unless I do my job earlier on supporting them. "Everyone's got their own roles to play to make sure the jigsaw works and I'm just one of those pieces. "It's the biggest one day race I've done to date. It's going to be a real brutal race as well. "There's often strong wind over there with it being flat in a lot of places so it's going to be a real tough race. "Last year it was clear Cav [Cavendish] was the favourite for the race and the troops rallied behind him. "But this year we haven't got an out and out leader but you can look at that in a positive way as well. "It just means you've got more strength in depth. I think we've got three guys who could possibly get a result on the day." Great Britain's team includes defending champion Cavendish, Tour de France winner and Olympic champion Bradley Wiggins, Tour of Britain winner Jonathan Tiernan-Locke and Olympic bronze medallist Chris Froome.